Sage Summit Atlanta is 8 weeks away but there are only 5 days left until the price increase on March 31st. 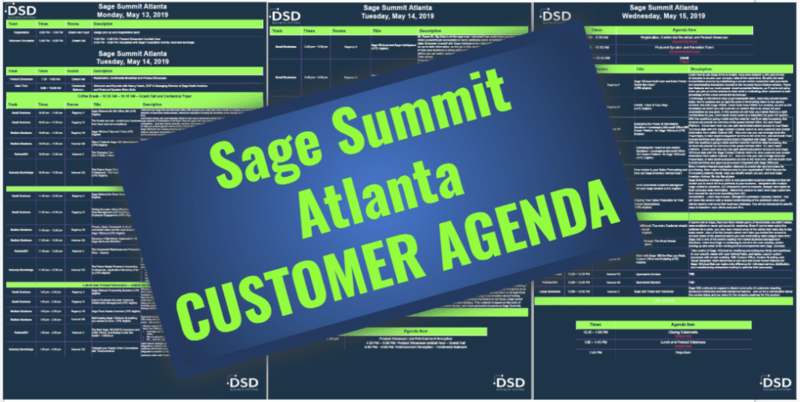 Check out the detailed agenda below and then head over to the Sage Summit Registration page to secure your spot! Sage 300cloud has exciting features and functionality. For even the most tenured user, there’s always more to learn and ways to decrease redundancy and over-orchestrated workflows. Join this tips and tricks session to learn handy shortcuts and productivity tools that will help you get the most out of your investment in Sage 300. Discover how Sage 50c and Microsoft Office 365 can give you a day back every month by bringing you the flexibility and freedom of cloud and mobile access, without the disruption of losing the familiarity of the desktop solution you know and love. In SD v. Wayfair, Inc., the Supreme Court ruled in favor of South Dakota, granting the state authority to impose sales tax obligations on out-of-state transactions. Afterwards, other states started changing their laws too. What does that mean for remote sellers? Come hear our panel of experts discuss the changes. Recent research in the Profession says that the business environment for CPAs and accounting professionals will be characterized by “unprecedented, massive and highly accelerated change” through 2025. To thrive in this new era of hyper-change and growing uncertainty, it is now imperative to learn a new competency – how to accurately anticipate the future. This session will show how to understand and anticipate trends and use them to find new opportunities for your firm and your clients. You will learn how to move from being a crisis manager to an opportunity manager and see farther into the future than your competition. Learn about the latest trends facing accounting and finance professionals. Identify strategies you can use to anticipate marketplace trends and develop opportunities. Apply the concepts of being Future Ready – Aware, Predict, Adapt to your organization and your career. How much money can your business afford to lose due to fraudulent activity and non-compliance? Small losses can have huge impacts on businesses of all sizes. Discover gaps that may exist in your business’ approach to fraud prevention and compliance – and learn about products, services, and tools available through Sage Checks and Forms that are designed to help you protect against various forms of financial loss. Extract more value from Sage 100 and Sage 100cloud with advanced training in manufacturing-specific features and applications. In this session, discrete manufacturers and fabricators will deepen their knowledge of Bill of Material and learn industry specific customization techniques using Custom Office. Also dive deep into how Sage Production Management can help businesses to track costs, optimize inventory, and monitor production statuses. Do you have delinquent customers, backorders due to stock shortages, or POs awaiting approval? Learn about a solution that helps you become more ‘data-driven’ – enabling you to avoid surprises in your business and anticipate and automate (rather than be surprised and react to) changing conditions in your daily business activities. There is a direct and measurable relationship between employee engagement and an organization’s success. Employees who know that they are working toward goals that drive business outcomes, as well as their own goals for professional growth and learning, develop ownership in the organization’s success, which boosts employee engagement. This session will connect the dots from organizational goals to job descriptions to individual goals, will show the different goal types and measures, and will demonstrate how ongoing coaching and feedback lead to a more effective performance review process. –Show the impact of employee engagement on the bottom line (i.e., revenue) of an organization. –Help you help your managers improve how they coach so employees can achieve their goals. –Highlight how performance reviews are changing into ongoing performance management and coaching. In this Sage 50cloud roadmap session, you get a closer look at the new features and functionality that will improve the way you and your clients work together, including: Outlook Connector, Automatic Cloud Back-ups, Cloud document storage, Sage Drive and more. Most companies report that their supply chains are becoming increasingly more complex—which isn’t all that surprising given that they are contending with widely dispersed manufacturing, warehouse, procurement, and sales activities, along with more and more global and outsourcing issues. During this session learn practical means to curtail this complexity costs and the inefficiencies that go along with it. The key to being Future Ready involves the right mindset, skillset, and toolset. This interactive workshop will build on Part 1 – The Future Ready Finance & Accounting Professional and focus on applying the Future Ready framework to transform your firm and clients. You will learn about developing a vision for the future, creating a winning culture and developing a learning and development strategy for yourself and your team that will make your firm Future Ready. Learn the difference between change and transformation. Use the future ready framework to predict the major changes facing your firm and clients. Understand the research and attributes of a winning culture and apply them to your firm. Apply the latest research on skills to develop a strategy for the development of your people. Create an action plan to create the firm of the future. CIMcloud: The Best Sage 100 B2B E-Commerce and CRM, Period. And Buying It Just Got Easier! Did you come to Sage Summit looking for solutions that will grow your revenue without breaking the bank? –Enter for a chance to take home a pair of Apple AirPods. See how other Sage customers use CRM to manage their business activities from lead generation to servicing customers. In this session, learn how your accounting system, connected to Sage CRM, enables your business to have access to customer information anytime and how to maximize these benefits across business units including marketing, sales and customer service. How much do you REALLY know about Sage 100cloud? Learn the key differences between Sage 100cloud and Sage 100, today and in the future. Find out about what the migration process looks like, and requirements for making the move. Join us for this engaging, interactive, and entertaining conversation! Whether a novice or expert, you may be ready to learn more about in-depth processing efficiencies that will help boost your productivity. This session is focused on data protection and maintenance, reporting, auditing, ways to streamline navigation and workflow, and more! Join us to explore these opportunities for your business! Session Description: Learn how eFiling saves you Time & Money! eFile W2s, 1099s, 940/941’s plus Unemployment, Wage Withholding, New Hire Reports & Payments for all 50 states seamlessly from your Payroll Software. Save time and gain control of your data with flexible, Excel-based reports that are ready to use with your information. In this session, you’ll learn about the many standard reports available to you and how you can customize them to suit your business needs. You’ll also discover how to use dashboards to visually represent and consume your business’s data and to identify trends. BI, Power BI, Big Data is all the rage now—but what if we could show you that you don’t need a powerhouse accountant or some additional piece of software to analyse your data. Empower yourself with Sage Intelligence to make better business decisions, based on up-to-date information, on the go! In this session, you’ll learn how to get a quick view of how your business is doing with a suite of ready-to-use online and Excel reports—which you can easily customize or drill down into as needed. Save time. Take control. Take action! In SD v. Wayfair, Inc., the Supreme Court ruled in favor of South Dakota, granting the state authority to impose sales tax obligations on out-of-state transactions. Since then, other states started changing their laws too. What does that mean for remote sellers? Come hear from our panel, consisting of a CPA, a tax compliance automation provider, and a Sage user, about their perspectives on the changes and the challenges that every business now needs to solve. From big data and network effects to the subscription economy and cloud computing, modern finance is undergoing its most fundamental transformation ever. Today, it takes a data-driven finance leader—someone who understands and embraces the promise and power of technology—to navigate this exciting, uncertain future. Attend this session and hear how Sage Intacct customers became data-driven finance leaders that proactively drove strategy and improved operations. This session is dedicated to the possibility that a firm can increase their financial performance by changing to measurements used from inwardly facing to measurements that look outside the firm. Changing these metrics is not easy as it requires firms to think differently than they have in the past. If you believe you can think a bit differently about your firm’s measurement systems, you are invited to attend this conversational session facilitated by Ed Kless, Sage senior director of partner development and strategy. Discover how Sage’s award-winning global HR system, Sage People, enables managers and leaders to better engage their people by creating great work experiences resulting in increased productivity and higher retention. Sage People helps companies revolutionize the way they work while lowering costs in 5 significant ways. By providing better workforce visibility and analytics, more efficient management of people processes, seamless integration with payroll, and easily accessed employee data, Sage People provides overall savings of time, labor, and capital, with a return on investment of 62%! This session is dedicated to the possibility that the majority of leadership thinking is wrong as it is ultimate based on manipulation—trying to “get someone to do something.” Coming to terms with this idea is difficult and not for everyone because it requires us to examine some of our most deeply held beliefs and either dismiss them or at least think differently about them. If you are interested in having a conversation about healing leadership, you are invited to attend this session facilitated by Ed Kless, Sage senior director of partner development and strategy. This material is based on the work of Howard Hansen and Steve Geske, who have presented at previous Sage Summits. Everyone has an AP document management problem, but why buy a solution that only solves that one issue? Achieve success by taking everything digital for any department in your company! Learn how DocLink customers have achieved significant time/cost savings by going paperless in AP, AR, HR, Legal, IT and beyond. Let’s talk about it! Join the Customer Listens session—now it’s time for you to talk to us. The panel of Sage 50 team members and Microsoft are here to answer your questions, listen to the enhancements you would like to see and brainstorm on what we can do better at! So come on let’s sit down and chat a minute! Refresh your understanding and gain new skill in the use of distribution and inventory management features in Sage 100. In addition to providing a practical overview of product features designed for distributors, attendees will learn high impact strategies for using data to optimize inventory while assuring industry-specific compliance. Specific attention will be paid to the Sage 100 Inventory module, Custom Office, Custom Scripting, and Sage Inventory Advisor Basics. Accountants—Learn how to build / strengthen a profitable Advisory Practice. You will leave the session with a deeper understanding of the additional value your clients need to overcome their business challeges. You will be introduced to specific ways to transform your clients and your firm. With the workforce going mobile and the need for real-time data increasing, this session will provide an overview of the power behind Office 365 and Power Platform. Come learn how you can gain anytime/anywhere access to your Sage 100cloud data with the Sage Contact Outlook Add-in to view customer and vendor information from within Outlook 365. Also see how you can leverage tools like PowerApps, to take anytime/anywhere access to the next level, and Microsoft Flow to build workflow and approval processes integrated with Sage 100cloud. HRMS – Have It Your Way! Technology is intended to help us get bandwidth back, especially around routine tasks. Some systems are so rigid the point of diminishing return is too quickly realized. Not with Sage HRMS. Come learn how HRMS is a solution, as well as the foundation on which you can build an HR system that is as unique as your organization as you grow. In this session we will help you realize there is a right combination for you. Don’t waste head count on a babysitter for your HR system. How mature is your Sales Forecasting and how can Sage Inventory Advisor help? Every inventory-based organization attempts to predict demand and plans for purchasing. How mature is that process in your organization? We’ll discuss the Forecasting Maturity Model, help you identify where you are, and how Sage Inventory Advisor fits into the picture. Sage Enterprise Intelligence (SEI) is next generation business intelligence that will enable you to reach the true potential of your business. Integrated with multiple Sage Business Solutions, SEI empowers users to visualize, analyze and report on their company-wide information. Attend this session to learn how Sage customers from around the world are benefiting from SEI. Sage 50cloud Multi-User and Bank Feeds – Worth the Hype? Learn how to use Sage Drive to enable local area network (LAN) and remote employees to access your company data at the same time. Simplify the bank reconciliation process by establishing a secure online connection with your bank and downloading transaction records to the Account Reconciliation window. These two features are our most popular cloud-connected features, so if you’re not using them yet, join us in this session to learn what is motivating other customers to take advantage of this cloud-connected technology! Sage 300 is one of the world’s leading mid-market Business Management Solutions. Learn how Sage is continuing to invest in the core solution, what’s coming up and some of the exciting recent developments with Sage 300cloud. Sage 500 continues to support a vibrant community of customers requiring advanced Distribution and Manufacturing features. Join us for a conversation about the current status and our plans for the on-going roadmap for this product. Sage50cloud – Tips every Customer should know about! If you’re new to Sage, there are likely hidden gems of functionality you didn’t realize were available or never got around to exploring. Even if you’ve been using the software for a while, you may have missed some of the extras that make day to day tasks easier. Join us for this session where we’ll take you behind the scenes to uncover some of the practical basics you can immediately start using to save time! Take control of Sage 100cloud by modifying and adding key fields and workflows to your specific needs with user defined fields, and tables. Launch custom processes with simple scripting. With Custom Office, Custom Scripting, and Visual Integrator, learn about how to use new and lesser-known features for Sage 100cloud that can make a big difference for mid-sized service, distribution, and manufacturing enterprises looking to optimize their processes.